Based on the relevant parts of a number of British Standards relating to the design and installation of natural stone floors, this Code also incorporates the requirements of the latest European Standards and current good practice. It sets out the principal factors involved when deciding to use natural stone as flooring and considers stone selection, design, laying, protection and maintenance, to assist in avoiding or disappointment with aesthetic results. 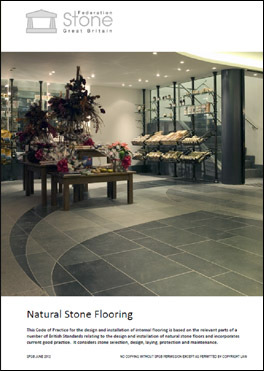 The Federation receives more enquiries and requests for advice on stone flooring than any other speciality. This code will prove invaluable if you are intending to use natural stone in any type of flooring situation. This latest edition has been prepared to provide an up to date and comprehensive guide to the use of natural stone flooring. It clarifies the definition of tiles and slabs and follows the requirements of the Harmonised Product Standards in readiness for CE Marking. Unlike the British Standard, this code includes specific details, information and guidance taken from a number of associated British Standards. This Code includes all of the latest developments and the best practice that should be followed when designing and installing natural stone flooring. The descriptions of the various types of stone within this Code follow the requirements of the European classification and includes guidance on the selection of screeds, with particular reference to proprietary screeds. It includes the latest guidance on underfloor heating, including operating temperatures. Slip resistance is also dealt with in detail including guidance covering sloping floors. The section dealing with cleaning, maintenance and protection has been up dated to include the latest guidance. Price | The Code is £50.00 (£30.00 for Stone Federation members) including postage and packing (postage charge for overseas). A personalised message printed on the inside front covers are available for bulk orders at no extra cost. Contact Stone Federation for details.